Charlie, an 11-year-old golden retriever lost both his eyes to glaucoma. When his owners added another puppy, Maverick, to the family, Charlie got his own little helper to guide the way. Charlie is a blind, 11-year-old golden retriever who has turned his new puppy companion into his own tiny "seeing-eye" dog. 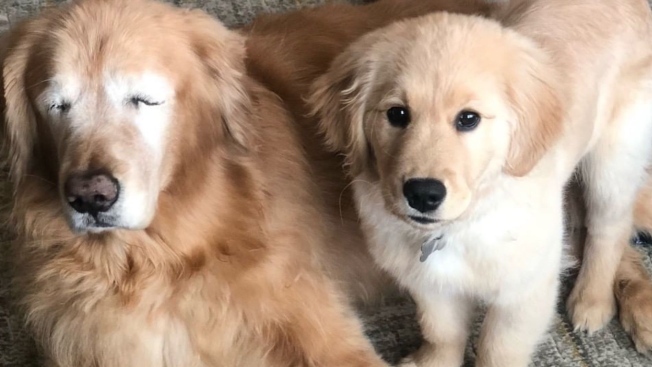 Charlie and Maverick are two golden retrievers that are taking social media by storm with their story — a 4-month-old puppy helping a blind dog "see" again. Adam Stipe has had Charlie since he was a puppy, his wife said. The older dog has adapted well to being blind and still loves to play and take walks. But the story of his own personal seeing-eye dog started back in 2016 when Charlie had to have his left eye removed because of glaucoma, which was causing the dog discomfort. Henri the bulldog beat out a gecko, a llama and a horse (among others) to become the next Cadbury "bunny." Only a year later, Charlie began to lose sight and experience pain in his right eye, so his owners decided to have it removed as well. “For us it was a no-brainer, empty our retirement plan to care for this dog because he makes us happy,” said Chelsea Stipe. Chelsea said she always wanted to add another puppy to their family, and getting one during her pregnancy would be the perfect way to make sure their child had a dog to grow up with. On New Year’s Day 2019, the family got a lively and friendly puppy named Maverick. Although Charlie wasn’t a fan of Maverick at first, the blind dog eventually got comfortable with the puppy. “They’re both pretty crazy and special. They’re definitely our entertainment,” Chelsea joked. As the two dogs became friends, Maverick began to notice that something was different about Charlie. “When they would play, Maverick would realize that Charlie would lose the toy sometimes, so (Maverick) would pick it up and put it back in front of him to re-engage playtime,” Chelsea said. Even during walks, the two dogs learned how to support each other. “They almost turn into little sled dogs where they’ll walk together,” Chelsea said. Chelsea submitted the dogs’ story and pictures to WeRateDogs, a social media account with millions of followers across Instagram, Facebook and Twitter. WeRateDogs contacted Chelsea saying that they loved her dogs’ story and would post Charlie and Mav. The post of Charlie and Mav on March 18 immediately gained hundreds of thousands of likes across social media with people commenting how much they adore the dogs. “It was crazy, it was not what I was expecting,” Chelsea said. Within an hour of posting the pictures, WeRateDogs reached back out to Chelsea saying she should consider making an Instagram account for her two famous pups. Once Chelsea made the Charlie and Mav Instagram, the account gained more than 20,000 followers in the first day. “Everything has just been so positive and loving and I’ve even had people reaching out about their dogs who had glaucoma,” Chelsea said.